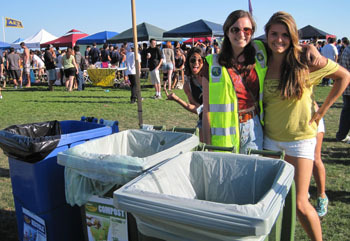 All of UCSC's colleges took part in a carefully coordinated "Zero Waste" move-in effort. 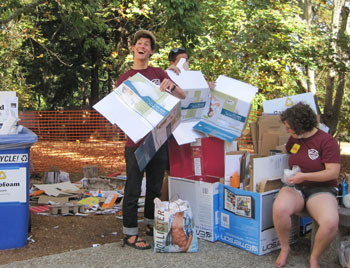 UCSC staff and students started off the school year by recycling a whopping 38,840 pounds of cardboard. In addition, 960 pounds of “plastic film” packaging material and three large bins of Styrofoam were collected for recycling. A local company will compact the Styrofoam and sell the pieces to another company that will use the material to make picture frames. The campus was able to pull off this feat because of a carefully coordinated effort. For the first time this fall, the UCSC Sustainability Office stepped in to organize a campus-wide eco-friendly move-in during Welcome Week, with help from Erickson. Meanwhile, the Student Environmental Center coordinated “Zero Waste” efforts at the Office of Physical Education, Recreation and Sports (OPERS) Fall Festival, which attracted thousands of students in late September. The festival, a chance to connect with student media, sports and recreation clubs, the Student Union Assembly, and other organizations, has turned into the biggest “Zero Waste” special event on campus. "There are so many opportunities for students to get involved (with waste reduction), especially this year,” said UCSC sustainability director Aurora Winslade. Last year, the nonprofit Ecology Action had a grant to work throughout the campus for a reduced-waste move in, but this is the first year that the Sustainability Office stepped into this role, supervising the project in conjunction with UCSC’s physical plant and housing facilities. "There was a big push this year to meet our waste-diversion goals, which is why I was here to fill that gap,” Erickson said. During move-in week, every college at UCSC had "cardboard corrals" where students could recycle cardboard containers and reduce move-in waste. Colleges also had bins to collect Styrofoam and plastic for recycling. UCSC has also been encouraging students to choose carefully when deciding what to bring to campus, and to avoid bringing products that come with excessive packaging. This year’s green-friendly move-in builds on UCSC’s existing reputation as an environmentally conscious university, with a number of recent awards for green building practices, and a new but already influential student-run Carbon Fund, which helps launch carbon-reduction projects on and off-campus. UCSC’s efforts have been recognized by the Sierra Club, which recognized the campus as the seventh "coolest" school its most recent ranking -- it second recent showing in the Top 10. UCSC already has a well-established “Zero Waste Move-Out” system across the campus, making it easy for students to deposit household goods, electronics and other materials in collection bins before taking off for the summer. In conjunction with the nonprofit organization Ecology Action, UCSC has been diverting more than 60 percent of its waste from landfills. For the eco-friendly move-out, the campus partners with agencies that can use, sell or redistribute the house wares, toiletry items and electronics, giving them new life while keeping them out of the landfill. Those organizations include H.O.P.E. Services, Goodwill, Second Harvest Food Bank, and Homeless Services of Santa Cruz.